Software has been part of modern society for more than 50 years. Developing software and applications using the standard software development models have evolved over the time period. The ‘code and fix’ style was being used for a long time until an alternative was introduced. From SDLC-to-Prototyping the world has moved to Web based application development. Today the web is being used as a rapid development platform, as it is easy to use with multiple browsers and devices that work on any operating system and require minimal technical knowledge on the part of the end user. 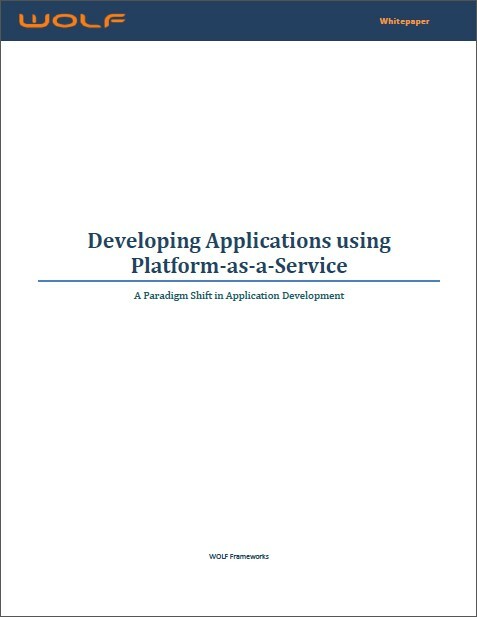 WOLF has released the whitepaper "Developing Applications using Platform-as-a-Service", focusing on the shift from the traditional application development models to the Platform-as-a-Service (PaaS) model. We hope you find it to be useful and informative. Cloud computing is an emerging computing paradigm aimed at running services over the internet to provide scalability and flexibility. The advantages in using the cloud for start-up and small businesses that lack infrastructure have been shown to far outweigh the disadvantages. Cloud platform services, also known as Platform as a Service (PaaS), provide a computing platform or solution stack on which software can be developed for later deployment in a cloud. 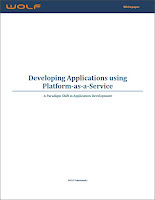 This whitepaper talks about developing applications using Platform-as-a-Service (PaaS) and how it is different from the traditional application development models. It proceeds to discuss the benefits of PaaS and how flexible WOLF Platform-as-a-Service is to build applications by giving an insight to its architecture. Finally we discuss about the various types of applications that can be developed using WOLF PaaS and give a detail comparison of WOLF application development to traditional methods.